So the past two days have been excellent landboarding weather and I have probably spend a good 6 hours just absolutely hauling. However my session ended today when one of my tires blew apart. I was sobering if this may be because I'm changing direction wrong. I usually lean back and bring the board perpendicular to the path of my nothing causing a skid then, carry on the other way. Is this the customary way of changing direction without coming to a stop or getting air. I think it may be taking a toll on my board. Any tips are much appreciated! I think skidding every time you change direction will be tough on the tires. Sounds like you may have advanced way beyond this, but this is the easiest way to change direction. Here is a video of me turning. I can see how this busted my tire, any critiques? You want to get a harness and get hooked in. It totally changes your pull and sends it to your core. The getting low and sliding out the turns looks good. It is just your arms / pull point that is challenging you. You could slow more and slide less but that's no fun! I slide turn at the end of every transition. I ride on a beach like you. My tires last 4-6+ years. The only tire I ever blew I blew the sidewall when the tire pressure was low from a leaky tube. That's strange. I wonder why mine blew, maybe I'm hitting to many shells. Are you over inflating the tires? If the sidewall fails from sliding it should be the outside edge on your toeside wheels and the inside edge on your heelside wheels. Does that jive with which wheel that is? Sometimes you just get a bad wheel, tube, etc. I've hit plenty of rocks and clam shells and nothing like that type of damage has occurred. Could just be dry rot. 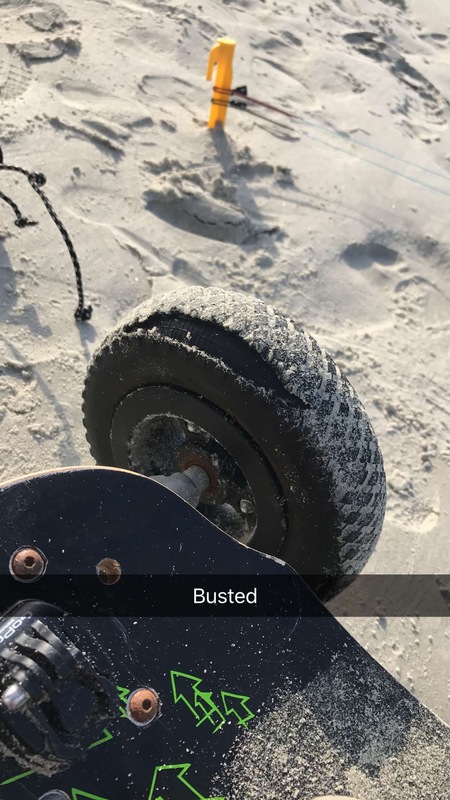 Was the wheel brand new? Correct me if I'm wrong, but that looks like an old MBS tire. By the look of the bearing the wheel is oldish as well. Any chance it's been out in the sun too much? You could just have weak old rubber for tires. My MBS yellow T3s have lasted for years now. They'll be out of tread before that happens. I also rinse all my gear after every session. Also as said previously, a harness would add a needed dimension to your riding. Keep ripping!